Daljit Singh is, according to the author's introduction, "a Sikh. He never smoked. He is a linguist knowing French, German, Spanish, Japanese and Italian. A gifted man with sound knowledge of law, he could point out flaws in arguments in courts. The police fraternity showed great respect for his genius and the criminals were awestruck when they knew that Daljit Singh was set against them. Despite all his greatness, Daljit possessed an innate sense of humour made them sit at ease in his presence (sic). He never let his credentials affect his relationship with patrons. Deeply sympathetic by nature, Daljit almost weeps when he senses that some clients had to face extraordinary pressures in life ...."
Unfortunately, little of this actually emerges in the text where, despite being described as "ace detective .... great detective .... famous detective .... great man .... dynamic detective .... most celebrated detective of the country" and one who "never erred in his judgment" and had been inspired by Sherlock Holmes, we are actually told very little about him as a person beyond the fact that he is "a small man with a large turban", barely 5 feet high. Little mention is made of him ever practising his faith (just once he stops to "prey (sic) to Lord Shiva") but I have included him here for the same reason that I included Shamani Flint's Inspector Singh: they are the only Sikh detectives I could find! Col K S Rajamani (1940 - ) went to school in New Delhi and graduated from the Hindu College, Delhi University with Honours in Physics. He was commissioned into the Corps of Engineers, saw some active service, and subsequently, after completing his engineering studies at the College of Military Engineering, Pune, served as instructor in Electrical Engineering for undergraduate engineering students. He became a Fellow of the Institution of Engineers (India) and, after retiring from the army, worked in several private companies before "taking up writing seriously". 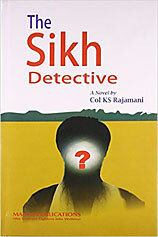 He has published a number of articles and essays, and is the author of Memorable Military Moments, as well as his first attempt at fiction, The Sikh Detective, reviewed below. He lives in Coimbatore. The Sikh Detective is made up of seven different short stories featuring young Daljit Singh and the two other members of his small but famous Mumbai based Detective Agency: young ex-cop Mohan and "young and able" secretary Rita. The stories range from an Indian nominee for the Nobel Prize being brutally murdered in cold blood, and two young men being stabbed to death in far away exotic Rajasthan, to the mysterious disappearance of a 75-year-old widow who had been terrified by a man with a "hideous face". What are the reasons behind the crimes? Daljit Singh is able to reveal all. The first thing that strikes you about all these stories is the "Indian English" in which they are written: "That doesn't sound good," Daljit tells a client. "It seems that some unsavory characters are hell-bent to subject your mom to heavy doses of fear .... I'll do anything for you to get the bottom of this and would work with the police department to nab the culprit soon." Even official crime photos are always referred to as "snaps", but it is not only the dialogue that is written this way (that might be more acceptable), but the whole narration. The second odd thing is the way that the police not only always offer Ranjit all the information he wants but actively encourage him to take the lead in questioning suspects and, indeed, in solving the case. Confronted with him, they just do what he tells them! We are not really told how he ever acquired his incredible reputation. Most of the actual leg work is done by Mohan who then reports what he has found to Daljit who puts two and two together, but the task does not always seem to require any very great detective skills. If he really is such a great detective, more evidence is needed! More seriously, there is a lack of exciting action, and many of the characters are too superficially described to come alive. It is hard to engage with them. The book ends with an index that comes as a complete surprise. I can think of no other work of fiction that has one! The book is published by Manas Publications of New Delhi whose motto is "We Convert Fighters into Writers" and who specialise in publishing the work of ex-officers, promising to "transform your work into a valuable publication. If you wish, we can also suggest you the suitable subjects for writing the books relating to your area of expertise .... We take utmost care in production." But not quite enough, unfortunately, as the Kindle edition contains some 13 consecutive pages with very odd spacing (new lines starting in the middle of sentences) and the arbitrary inclusion of unexplained numbers (as 14th in bold type just after the heading of the first story). I'm afraid it is not a book that I can recommend. There is hardly anything about the author on the web. The Kindle edition suffers from some faulty spacing.